The Siberian and its sister ship the Carthaginian, were built in 1884 in Glasgow by the Govan Shipbuilding Co. and operated under the Allan Line out of Liverpool, England. The Siberian was launched on June 12 of that year and her maiden voyage from Glasgow to Quebec and Montreal was just three months later. Her ports of departure alternated between Glasgow and Liverpool and she seems to have been busiest in her early years. According to the Library and Archives Canada, there were 2,0 00 British Home Children brought to Canada on this ship. The Allan Shipping line, founded by Scottish Captain Alexander Allan of Ayrshire, was the largest internationally privately owned shipping company by the 1880s. The Captain’s second son, Hugh had previously ousted the Cunard Line for the extremely lucrative British Royal Mail contract between Britain and North America. When the Canadian Pacific Railway (CPR) was completed in 1886, that company was awarded the China Mail contract. In the beginning, they chartered ships and then built three Empress liners for the Far East service sailing from Vancouver in 1891. They also relied on chartering ships from other shipping companies including the Allan line for the Atlantic link for the all-important Hong Kong mail service. That same year CPR created the Canadian Pacific Steamship Company (CPSC). In 1891, the Allan Line took over the State Line (founded in 1872) and was often referred to as the Allan & State Line. In 1892, the Siberian was listed as sailing for the Allan and State Line with her destination as New York. 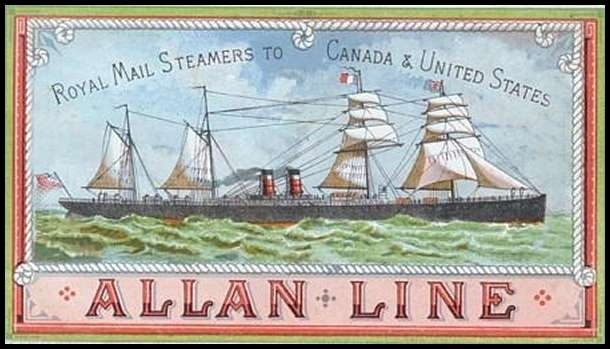 In 1897, the various branches of the Allan shipping empire were under one company, Allan Line Steamship Company Ltd., of Glasgow. The company by then had added offices in Boston and London. CPSC acquired the successful Allan Line in 1917 however the SS Siberian’s fate had already been sealed when she was broken up at Falmouth in England in 1912.